Since the International Jury focused on the Atmosphere as the main theme of this cycle, they believed that the most important achievement in this field was the establishment of the Intergovernmental Panel on Climate Change (IPCC) which was established by the UNEP and WMO in 1988 in order to provide a forum for scientists from around the world to study and exchange information on the global problem of Climate Change. The Panel studied the scientific justification, determined the health and environmental impact and came up with practical alternatives and suggestions to stop or slow down the rate of change and rise in global temperature. The Panel also worked on mechanisms of adaptation with the impact of this serious problem. The preliminary report produced by this Panel was the basis for the decision of the United Nations General Assembly to start negotiations towards an international convention for Climate Change. This important convention was articulated at the Earth Summit on Environment and Development which was held in Rio de Janeiro (1992). This was followed by the famous Koyoto Protocol, which calls for calculated reductions of Green-house Gases emissions from Industrial Countries. The world is still putting pressure on the USA and Russia to sign and ratify this protocol so that it can be implemental. The IPCC is still working hard providing more and more accurate data and explanations for the Climate Change at the global level. Hence, the Jury looked back into the history of the IPCC and found that Prof. Obasi was a key person in the establishment, but two other prominent professors shared the credit with him. 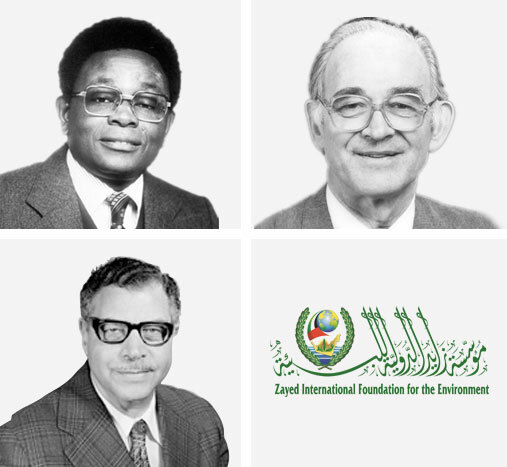 These are Prof. Mostafa Kamal Tolba, who was the Executive Director of the United Nations Environment Program (UNEP) at that time, and Prof. Bert Bolin of Stockholm University, who was the first Chair of the Scientific Committee. Accordingly, the Jury agreed that the prize for the 2nd category would be shared by the three professors who worked together to establish and run the IPCC. These are Professor Godwin Obasi from Nigeria, Professor Mostafa Kamal Tolba from Egypt and Professor Bert Bolin from Sweden. Prof. Obasi was Secretary General of the WMO for over 20 years and his achievements and outstanding performance are well known among the international organizations and all those who are related to this field. Prof. Bolin is also well know in this field for his role in many national and international committees as well as his role at the Stockholm University.